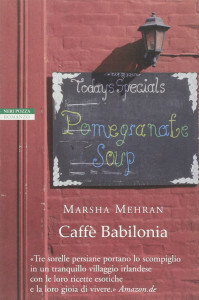 “Coffee Babylon” is the colorful semi autobiographical novel by Marsha Mehran ,Iranian author forced to leave Tehran to only two years, because of the highly repressive climate of the Khomeini revolution, to take refuge in Buenos Aires, where her parents opened a café with bullets to their land. And, as often happens when imagination somersaults come to the rescue of the harsh reality, the author takes refuge in the creative power of words to tip over into new worlds that mix the various ingredients available. He spent most of his life in the United States and in Australia, and moved to Ireland, where in 2014, at the young age of 36 years, died in mysterious circumstances, leaving his loyal readers who have lost a talented pen and the last story to read “Pistachio Rain”. “Coffee Babylon” is just that: that place so different where lives intertwine and distant flavors , and in which each of us for once would, indeed should go. Take Bellinacroagh , a village of a few souls of ‘ West of Ireland , and former bakery for rent, add Marjan , Bahar andLayla , three sisters forced to flee from Tehran because of the target Iranian revolution London, and condiamo all with the crowds and risky adventure: leave the English capital at a time of green Ireland to open a cafe that honors its traditions shutters . Recipe winning fiction , especially if enhanced by a not insignificant detail: it will be a van in perfect hippie style to lead them to the new life along with a thousand and one flavors and spices of which, as claimed by Marjan, the West underestimated the incredible value. An adventure that would not be if there were no obstacles and twists , especially in the case (very present) in which the novelty of genres diversity a silent distrust fed by a chatter even more annoying, even before a healthy curiosity. It is a strength all played on emotions, because even before the indispensable cultural nuances, our being subject to sentiment makes us vulnerable in the same way. Sometimes we forget that, until it we bump against a tangible difference that captures our attention. Despite the battle against prejudice is too often unsustainable, especially if fought in the minority, the vitality of these three women and their blood bond is able to transcend any cultural barrier. Every Marjan recipe preserves all the ‘ exoticism that sisters seek to protect, each dish is an invitation to sit at the same table, forgetting their origins, canceling the filters preconceptions and letting enveloped by the special atmosphere of sharing. And that’s what will happen when Thomas McGuire’s , operator of the leading local Bellinacroagh and owner of the pub busiest in the country, decide to appropriate to all of the local costs of the three Aminpour sisters (which is aimed at constant contempt) trying to persuade the owner, the wife of the deceased Dalmonico pastry, to give him ample space to turn it into a nightclub to be attached to the pub. It will certainly be a shock for raw Thomas find that between the son Malachy and Layla , the youngest of the three women, was born a sudden and compelling love, additional source of pitfalls. The effect that Marsha Mehran causes is this: open up literally to the discovery of a place to have a new fragrance and rediscover sensations . And the biggest surprise is to see that everyone, at least once, we’ve stayed there but, so far, we have taken for granted. Each chapter is introduced by a recipe of the Persian tradition, the dishes spiced rice with the ‘ smell of happinesssweet typical of the desert, baklava , as an anticipation of the flavor of the events that follow. Again the’ element culinary become a great plot device to observe closely the delicate issue of diversity overall, and first true means to overcome the high walls. to this is certainly unite the courage and the ‘ power of three women who never miss a chance to support themselves, as if they belonged to a single body, that in the difficult search for peace is always able to enjoy the little joys of their tradition far only in space. the Iranian author retraces a bit ‘its enriching history with the virtuosity of imagination (as the name fictional locationsBellinacroagh ), through a wrap-writing which at times betrays some familiarity; and there is nothing more beautiful than to be confronted with real emotions experienced. A small gem , this novel, which when closed press us a slight smile on his lips.